The 1972 Miners' Strike was noticeable as it was the first time since 1926 that British miners had been on strike. It came about because of disagreements between the miners and the Government over pay; throughout Britain's industry there was a widespread hostility to the Tories' offers of pay. In the 1971 NUM Annual Conference, it was decided to ask for a 43% pay rise, at a time when the Tories' were offering around 7-8%. In late 1971, the miners voted to take industrial action if their pay demands were not met. On the 5th January 1972, the National Executive Committee of the NUM rejected a small pay rise from the National Coal Board, who then 2 days later, withdrew all pay offers from the last 3 months. On the 9th January 1972, miners from all over Britain came out on strike. In South Wales, 135 pits were closed; 50 collieries and 85 private mines. At first the miners picketed at coal power stations, but then it was decided to target all power stations, and also steelworks, ports, coal depots and other major coal users. In South Wales, dockers at Newport and Cardiff supported the miners by refusing to unload coal from ships. On the 21st January, the NUM decided to try to stop the movement of all fuel supplies. Miners from South Wales were involved in the pickets at the Saltley Marsh Coal Depot of the West Midlands Gas Board. On the 9th February, a state of emergency was declared and 2 days later, the three day working week was introduced to save electricity. On the 19th February, after much negotiation, an agreement was reached between the National Executive Committee of the NUM and the Government. Picketing was called off, and on the 25th February, the miners accepted the offer in a ballot, returning to work on the 28th February. The result of the strike was that the miners' wages became almost the highest amongst the working class. The strike also showed the country how important coal was to the country's economy. By 1973 however, the miners had moved from first in the industrial wages league to eighteenth. The miners saw however, that the poor economic situation that the country was in could be used to their advantage. The Arab-Israeli War was causing oil prices to soar, and throughout the country, relations between the industrial unions and the Government were hostile as the Tories were attempting to introduce pay freezes and restraints to help the economy. In late 1973, the miners once more voted to take industrial action if their pay demands were not meet. They were not, and so on the 9th February 1974, the miners came out on strike. The Government refused to compromise on a 7% pay rise, and the situation lead to Edward Heath, the Prime Minister, to declare a state of emergency and introduce a three day working week. 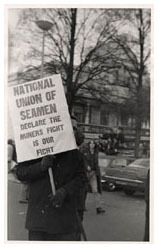 The General Election and the Industrial Relations Act meant that picketing and campaigning were low key compared with the 1972 strike. Edward Heath called a General Election for the 28th February believing that the country would be in sympathy with him, but the Conservatives were defeated. 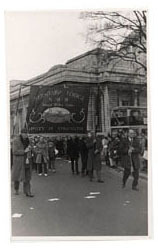 The Labour Government and the miners reached a deal shortly afterwards and the strike ended. The new Secretary of State for Employment, Michael Foot, implemented the Pay Board Report which showed how miners' pay had dropped since 1972. As well as increases in pay, there were two other important results of the strike; the implementation of a scheme for compensation for pneumoconiosis sufferers, and a new superannuation scheme which commenced in 1975. Pitt Malcolm. The World On Our Backs. The Kent Miners and the 1972 Miners` Strike. (London, 1979). All items listed in the further reading are available for consultation in either the South Wales Miners' Library or the Library and Information Centre, University of Wales Swansea. Click here to link to the library catalogue.